If you are like me then you love products that are meant to last a lifetime. If that is the case, then you may be reading this to see if the Groom Mate Platinum XL is one of those products. It may seem strange to get excited about a nose hair trimmer, but here I am ready to try to get you as excited as I am. There is actually a lot to like about this nose hair trimmer. This nasal hair trimmer requires no power besides human. It can be used anywhere at any time. It has no plastic parts so with the proper care can last a lifetime. Will you be passing down this nose trimmer to your grandkids? Well, you could, but I am not sure how they’ll feel about using a nose trimmer that you used for decades. Ok, so what makes this the best nose trimmer on the market in my opinion? Let’s dive in and take a closer look for this nose hair trimmer review to see what the Groom Mate manual nose hair trimmer has to offer! After you’ve finished reading the article, make sure you check out our guide on how to safely trim your nose hairs! The entire nose hair trimmer is made out of sturdy stainless steel. There is no plastic and no electronics inside. It is pretty solid because of this and is the reason that the manufacturer guarantees this for life. Since it is stainless, you don’t have to worry about it getting rusted or corroded. Keeping it dry is still a good idea, though since you don’t want to have to keep lubing it to make it work smoothly. The blades are patented and guaranteed to never wear out or go dull. They are easily the best out of any nose hair trimmer including the battery powered or rechargeable. If you maintain it, this manual nose trimmer will last for years or even decades. Don’t worry, though. Maintenance is as simple as it gets. After each use, just use the included brush or an old toothbrush to wipe away any hairs or snotty bits. You can even run the tip under some water to rinse it off. Just make sure to let it dry completely. If you notice that it is getting squeaky, or it is not working as smoothly as it used to, it’s time for a deeper clean. To do so, there is a screw on the side that allows you to open up the body. Just add a couple of drops of oil in there and close it back up. It literally only takes a minute to do this. At only 2.5 inches long, it is very compact and easy to handle. It can fit easily in any Dopp bag and takes up virtually no space in a medicine cabinet. It only takes up slightly more space than a AA battery. And weighing in at 1.4 ounces, it feels light. The only issue you may have because of the size is that you might need to dig around in your bag to find it. Luckily, there is the option of buying it on Amazon.com that comes with a travel pouch. That will make it a bit easier to travel with. Using a nose hair trimmer should be pretty self-explanatory and not need any special instructions. The Groom Mate Platinum XL is no different, really, but there is a bit of a learning curve since it is manually operated. With most nose hair trimmers, you can use it one handed so it is much easier. Complicating things, only slightly, is the fact that you need to use both hands to operate. With one hand, put the tip of the trimmer in one nostril. With the other hand, rotate the base of the trimmer to cut the hair. It’s important to make a full rotation of the blades to make sure that the hairs get fully cut. Otherwise, if you remove the nasal hair trimmer, then it may actually pull a hair or two out. If you make a full rotation, the Groom Mate Platinum XL blades are so sharp they will definitely never bend the hair, making it as pain-free as nose hair trimmers come. The hair mostly gets cut by coming into the blades from above. It’s important to angle the blade where you need to cut the hair and move it from spot to spot to get all of the hairs that need cutting. Who is the Groom Mate Platinum for? There is definitely no one type that would want to use this manual nose hair trimmer. But, it is pretty obvious that people who live off the grid or are preppers will love the manual aspect of it. If power is to go out for an extended period, then you don’t have to resort to plucking your nose hairs or using scissors in your nostrils. Then there are the minimalists, which I count myself amongst, that really like simple and ingeniously designed products. I love the fact that it doesn’t use any electronics, feels good in the hand and looks like something that somebody 200 years ago would have used. These days so few things are built to last, that people that appreciate a well crafted bit of gear will really enjoy this aspect of it. Then there are the people that just like things that work well and last a long time. The fact that the Groom Mate Platinum XL blades stay sharp for so long is a great selling point, especially for frugal people who hate planned obsolescence of so many products out there. Those are the types of things that are meant to only last 2 or 3 years so you are forced to replace it when they could easily be engineered to last longer and just charge a bit more money. Groom Mate Platinum vs Kedsum Pro | Which is the Best Manual Nose Hair Trimmer? The Groom Mate Platinum XL is not the only manual nose clippers on the market. But, are they the best? In a head to head with the Number 2 manual nose hair clippers, the Kedsum Pro, how do they compare? The only similarities between the two are that they both are hand powered, and are made out of stainless steel. Aside from that, they are quite different. The Kedsum does get the nod as far as ease of use goes. Since it uses a mechanical pivot, you only need one hand to trim your nose hairs. It also has a slight advantage in that the head is covered and it is very hard to get nicked due to the design. That is also a flaw, however, since it makes it harder to cut the nose hairs. You have to go over the same spot a couple of times to cut all the hair. And the tip is a bit wide, so it is kind of larger to move around to get the right angle in the nostrils to cut all of the hair. I think the edge definitely goes to Groom Mate on the blades and the size and shape of the tip. It is much easier to cut the hair and it cuts much better. Yes, it can pull the hairs, but once you get used to using it, that won’t happen anymore. I like that the Groom Mate has less moving parts also. Though it is too soon to tell, I think eventually the Kedsum will have some parts that simply fail from overuse. That definitely will never happen with the Groom Mate XL. As of the time of this writing, the Kedsum did come with what could be one of the best nail clippers on the market as a freebie thrown in. It’s too bad that you can’t buy the nail clippers separately so you could pick up the Groom mate and then order some really solid fingernail clippers too. Here is the link to the Kedsum on Amazon.com if you want to compare the nose hair trimmer reviews and see for yourself which you think is better. Final Verdict | Is the Groom Mate Platinum Manual the Best Nose Trimmer? 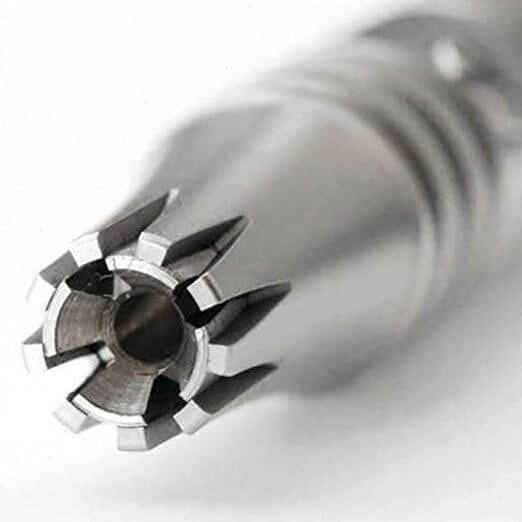 Reliability – This best nose trimmer simply never breaks down and doesn’t have parts that wear out eventually. You will never have a stray nose hair that ends up getting plucked out by hand because your trimmers broke down on you. Quiet – It is like a whisper when you consider how loud some battery operated nose trimmers are. If you have to trim your nose hairs and don’t want to disturb your partner early in the morning, then this is an ideal solution. Gentle – Aside from any painfully pulled hairs when you are first starting out with the GroomMate, it is very gentle. If you are looking for a sneeze less nose hair trimmer, then you will love the fact that the cutting head doesn’t buzz around. That causes a lot of guys to sneeze a lot when trimming their nose hairs. Lifetime Guarantee – When something can be returned no matter how long you have been using them with no questions asked for your money back, then that says a lot about how it is manufactured. There is no risk to buying these due to that level of customer care. If you don’t think it is the best nose trimmer then just send it right back. If you want to compare the Groom Mate to other battery operated or rechargeable nose hair trimmers, then you can check out our guide to the best nose trimmers here. 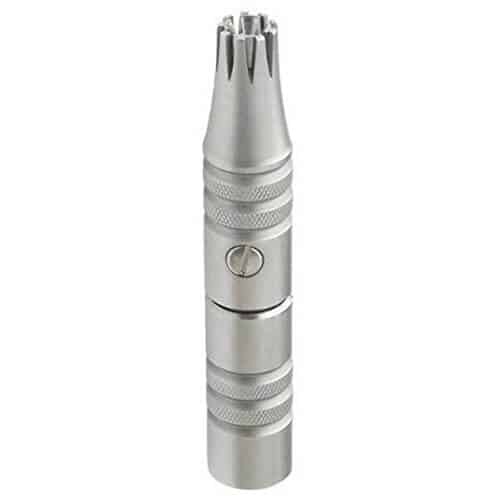 Any thoughts on this nose trimmer or others? Did you find this nose hair trimmer review helpful? Drop a comment in the box below and let us know what you think!